One of the most overlooked issues, especially with homemade costumes, is whether or not the costume is flammable. You need to make sure that the costume will not catch on fire if the material comes in contact with a flame; even for a very brief period. Keep in mind that your children will be going up on porches with pumpkins that have a lit candle. Children have brushed against a pumpkin with long, flowing costumes that have caught on fire. Use care to make sure that costume pieces will not trip the child. Make absolutely sure that the child can move freely and see well. Remember that young children will be climbing steps and walking through yards that they are used to. Make sure your child can be seen! Select costumes that are bright colored. 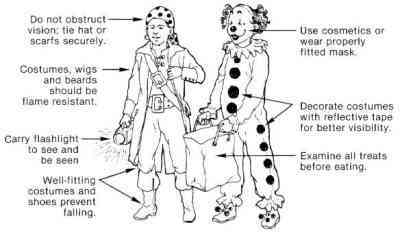 If that is not possible be sure to decorate the costume with reflective tape or reflective fabric paint. Reflective tape can be incorporated into the costume. For instance, if your child wants to be a witch with a black cape, cut stars out of reflective tape and put them all over the cape. **This image was reprinted with permission from the Consumer Product Safety Commission.